Cal Fraser in Editor's Picks World Affairs on 28 May, 2017. Recent escalations of tensions have involved a US warship sailing to the peninsula, the failed launch of a North Korean inter-continental ballistic missile, and accusations of CIA involvement in a failed nano-poisonous assassination attempt on Kim Jong-un. This has not only coincided with Trump’s cosying up to Chinese leader Xi Jinping at Mar-a-Lago, his personal resort in Florida, but also the election of left-leaning Moon Jae-in as the new South Korean president earlier this month. 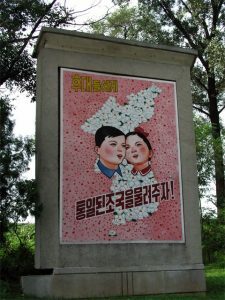 A truism in foreign policy circles is that if any regime change were to occur in North Korea, the Chinese would be in the driving seat, as the risks of US military intervention pose far too high a risk to its South Asian allies Japan and South Korea, particularly to the Southern capital Seoul which sits within confirmed North Korean artillery range. However, the victory of Moon presents the potential arrival of a fourth player, and new dimensions to the geopolitical predicament. 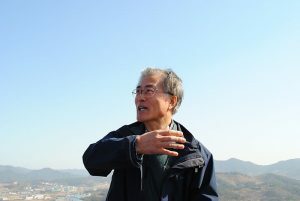 Moon has long stood as an advocate for ‘Sunshine Policy’, a term used to describe dialogue and an engagement with Pyongyang from the South. Symbolising a departure from the hard-line of impeached former president Park Geun-hye and encapsulating a wider sentiment in the South’s population for greater openness with its Northern neighbour. 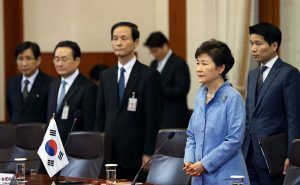 Former President Park Geun-hye (in blue), whose approval ratings fell to a record low of 4 percent, was impeached last December and is now facing trial for charges of corruption and selling state secrets. The election of Moon points to the potential of an embryonic ‘talk about talks’ with Pyongyang, but a new dynamic dictated by a fourth player could greatly reduce tensions between North Korea and the US and in turn improve one of the many sore spots in Sino-American diplomacy. Whilst Trump seeks to make the US more ‘unpredictable’; instrumentalising risk and threats as a strategy has never been tested in the context of the Korean dilemma, and the danger of miscalculation increases exponentially if one were to interpret Kim’s threat of launching ‘nuclear-armed missiles at the White House and the Pentagon’ literally. The panglossian scenario of a Korean reunification is not necessarily ideal for China nor the United States. A united Korea would further tighten the noose of military bases around China in strategic positions, a source of tension between the two states, especially in light of China’s desire to exercise hegemony in the South China Sea. Moreover, if the regime were to collapse without peaceful reunification, the flow of refugees into China would be a humanitarian nightmare of catastrophic proportions. Meanwhile, the US would front the lion’s share of the cost for a peaceful reunification, and the cost of developing North Korea’s infrastructure would be enormous, many more times larger than the costs linked to reunited Germany following the fall of the Berlin Wall. For an administration that cannot quite decide whether to pursue interventionism or isolationism, and instead which looks to ‘win’ in international affairs, it is difficult to imagine a convincing narrative that could be sold to the American taxpayer to justify another crack at state-building. Reunification, whilst still the goal of both the North and South Korean governments, remains a distant hope unlikely to be realized in the near or mid-future. However, the current state of affairs (and the associated risks of conflict between two recalcitrant leaders) could have potentially cataclysmic effects globally if it remains unsolved. The much cited Thuycidides trap suggests that the incumbent hegemon, the US, and the rising power of China are doomed to lock horns as mutual suspicion and fear festers, while a comparatively minor event catalyses a string of disastrous and seemingly disproportionate consequences, such as the assassination of Franz Ferdinand marking the beginning of the First World War. Equally, despite the rhetoric of reconciliation, the US-Chinese relationship is delicate at best. An error of judgement from either Trump, Kim or even Xi could have the potential to unleash the apocalyptic scenario of conflict between two nuclear superpowers. Resolving the Korea dilemma is quite rightly of great concern to watchers in this period of uncertainty. However, as Ian Bremmer, founder of political risk firm Eurasia, argues, American attempts to continue isolating Pyongyang will play into the hands of its despotic ruler, as his narrative will gain credence and the citizens will remain powerless and unsupported. If Moon is to successfully develop a mechanism of dialogue, and if Kim Jong-un is prepared to tentatively reengage in the global political sphere with gentle encouragement from China, there may well be light at the end of the tunnel. However, these are big ifs. What is certain is a difficult situation in East Asia and further afield – North Korea’s unpredictability, Trump’s desire to emulate this trait within his own administration, a cautious China and a politically paralysed Seoul.